Stefan Berg revives the wordless graphic novel in his portrait of the ‘first man of jazz’. Very little is known of Buddy Bolden. His music was never recorded and there is only one existing photograph, yet he is considered to be the first bandleader to play the improvised music that has since become known as jazz. Let That Bad Air Out tells the tragic end of a brilliant nineteenth-century jazz pioneer using traditional linocut printmaking techniques executed with a sharp and contemporary boldness. ‘Art books published by The Porcupine’s Quill never disappoint. Let That Bad Air Out: Buddy Bolden’s Last Parade is another glowing example of the superb quality of the releases from this marvellous small-town Ontario press. ‘In a series of brilliantly rendered linocut relief prints, Berg tells the story of Buddy Bolden, a New Orleans jazz musician living from 1877 to 1931. Each crisp image masterfully succeeds in evoking a feeling of the fluidity of the music, the boisterousness of the community, and the darkness of the events surrounding the musician’s demise. An introduction by Donald M. Marquis, author of In Search of Buddy Bolden: First Man of Jazz, and an afterword by renowned artist, George A. Walker, round out this collection. Charles ‘Buddy’ Bolden was a New Orleans musician at the turn of the 20th Century. He is considered to be the first bandleader to play the improvised form of music, which later became known as Jazz. Buddy was the first ‘King’ of the cornet in New Orleans, and is remembered by musicians as one of the finest horn players they had ever heard. In April, 1907, at the age of 31, Bolden burst a blood vessel in his neck while playing his cornet with Henry Allen’s Brass Band. Tragically, this developed into paranoid dementia for which Bolden was hospitalized in June 1907. He remained there until his death in 1931. Let That Bad Air Out is a book of seventy images depicting the story of the legendary Buddy Bolden in his last New Orleans parade. It was the culture of the New Orleans parade and its unique music that sparked my interest in Buddy Bolden. I wanted to tell the story of his music and capture the energy and the movement of the parade in hand carved images. Bolden played his cornet with such power and clarity that it is said his music could be heard from miles away. Because he was never recorded, this unique sound has been lost to history. The quiet left in Bolden’s wake seems a fitting subject for the silent novel. The title for this book is taken from lyrics attributed to Bolden, ‘... open up that window and let that bad air out....’ referring to the need to refresh the cramped, sweaty atmosphere of the late night dance halls. I think it is an appropriate appeal to a culture that communicates predominantly via complex technologies. This is a creative work that responds with a much needed dose of simplicity. My intent is to uphold the traditional techniques of printmaking while remaining a contemporary artist. The work of a block cutter is a simple yet noble practice; a craft handed down from the Middle Ages. It requires only a simple surface (in this case linoleum), a cutting tool, and an idea. It appeals directly to the eye and to the imagination. I was introduced to New Orleans jazz at Grossman’s Tavern in downtown Toronto, by a band called The Happy Pals. 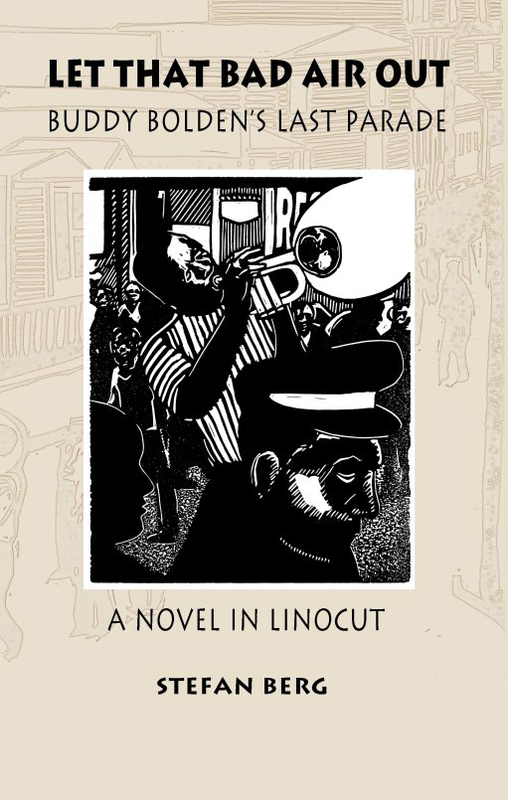 Michael Ondaatje’s novel, Coming Through Slaughter stimulated my interest in the legend of Buddy Bolden. I wanted to create a silent novel about a particular sound and express the energy of a New Orleans parade through still images. Film footage from the late 1950s, of the Eureka Brass Band marching in New Orleans, gave me the visualization of how my story would unfold. The drawing process was absolutely essential in developing the block image. Drawings were overlayed, continually redrawn and combined with collaged photography. This helped to develop a rich quality of depth and a full spectrum of space. A second editing process occurred while cutting into the blocks. I was able to reevaluate my images as they were being finalised. I chose linoleum as a cutting surface for this reason. The original manuscript was printed by Justin Labine and myself, in black ink using a Grafix Proofing Press. I embraced the expressionists completely. The sensation of raw emotion; a tangled jumble of exposed nerves and explosive actions. The relief print is inherent of these qualities. What translates from a block to paper is a balance of spontaneous mark making, what is created in an ecstasy of fumbling, juxtaposed with strategic highly constructed marks of precision. Wordless novels first appeared after the First World War when the artist Frans Masereel applied his creative genius to making books written in wood engravings, telling a story without the use of the written word. Masereel’s books, beginning with The Passion of a Man (1918), were the dawning of the sequential picture narrative that would reach its height in the 1930’s with the work of American Lynd Ward (God’s Man, Vertigo, Mad Mans Drum, Wild Pilgrimage) and fall into obscurity in the 1950s when the last wood engraved wordless novel appeared, written by the Canadian Laurence Hyde (Southern Cross, 1951). Stories told in pictures have a universality that transcends the boundaries of any spoken or written language providing the reader with a unique experience of a narrative akin to a silent film. Let That Bad Air Out is the first in a series of wordless novels to be published by the Porcupine’s Quill. The aim of this project is to publish wordless books created using the relief printmaking techniques of linocut, woodcut or wood engravings. Each book will feature original work created by contemporary printmakers. The reason for choosing relief printmaking to illustrate these stories is not only to pay homage to the artists who started the tradition of the wordless novel but to help revive interest and appreciation of the rich qualities of line and texture indicative of relief printmaking. This style of printmaking is not dead and forgotten, but is alive and blossoming in the youthful hands of artists such as Stefan Berg. 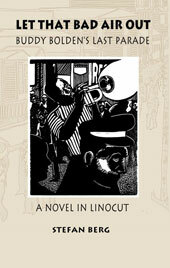 Stefan Berg’s story of the great Jazz cornet player Buddy Bolden is a fine narrative for a story in linocuts. Berg (a former student of mine) is obsessed with the story of Bolden whose tragic death and legendary playing have awed jazz historians for decades. He takes us through the New Orleans parade where we find Bolden standing out from the band, captivating his audience before falling victim to a mental breakdown. Although no recordings of this legendary Jazz musician can be found, we can again appreciate Bolden’s influence, quietly, with Berg’s story in pictures. Stefan Berg is a painter and printmaker who was born in Toronto in 1985. He finished his final year at the Ontario College of Art and Design in 2008, winning the Eric Freefield Award, and since then has lectured at the college on occasion. 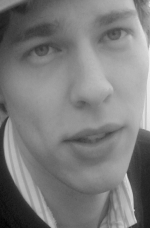 In 2009 he founded the Lower Dawes Studio in Toronto. Stefan currently works with intaglio and relief printmaking mediums. He has been featured in the Toronto Star and in Canadian small press publications ‘Cut And Print’ and ‘Block Cutters Social Klub’, published by the Free North Press. The Free North Press also published Stefan’s first independent book, After a While, a selection of block work from 2002 to 2006. The recipient of multiple scholarships for excellence in painting, photography and printmaking, including a post graduate entry scholarship, Stefan’s intent is to uphold the traditional methods of printmaking as a contemporary artist.